When dancers look at a class, piece of choreography, or performance, they don’t just see the final product. They see years of training, months of rehearsals, expensive medical bills, and nonexistent retirement plans. However, many companies seeking to hire dancers don’t see all that. Because they’re inundated with Instagram stars “hitting dem folks”, they think anyone can be a dancer and that they can pay us next to nothing to “do a little dance.” Then we are left with no money, no recognition, and no prospects of lasting success. Dancers know that we deserve proper compensation, and it’s time the rest of the world knows as well. 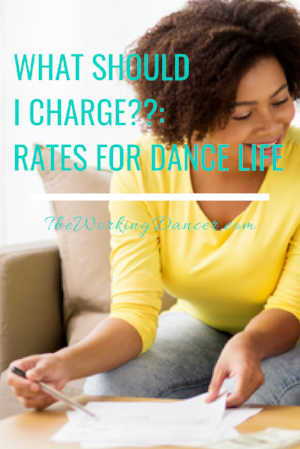 Check out my list of tips on how performers, teachers, and choreographers can calculate their rates. Fortunately, dancers have multiple resources that provide standardized performance and rehearsal rates, and the more we turn down jobs that fall below this standard, the more that well-paying jobs will become the norm rather than the exception. Specific resources include Actors Equity (for those in musical theater), SAG-AFTRA (for music videos, film, and award shows), and the American Guild of Musical Artists (for companies like Alvin Ailey). For general numbers, every dancer should become familiar with the minimum rates set by the Dancers Alliance. DA lists minimum rates for rehearsals, performances, travel days, fittings, and more. One of the most important things they define is hazard pay. My favorite sentence on the whole site is, “In all instances, dancing on concrete shall be deemed hazardous.” Dancers are often expected to rehearse, take class, and perform on concrete—an unforgiving surface that can cause shin splints, compacted knees, uneven hips, and subluxations of the spine. And it can certainly shorten a career. Other activities deemed worthy of hazard pay include performing knee slides without knee pads, doing lifts full-out more than three times per hour, and dancing near elements like smoke or fire. When I was first starting out, I was asked (read: told) to do ALL those things without mention of extra compensation, and I didn’t blink an eye. It’s so important for us to educate ourselves on proper working conditions so that we can demand them from our employers. Teaching rates will vary significantly based on experience, expertise, and talent. Local rates tend to be based on an hourly rate while traveling jobs tend to use a package rate. Some also differentiate among classes, masterclasses, and workshops, and it’s valid to charge more for a one-time masterclass or workshop than a weekly class. One great way to calculate these rates is the Freelancers’ Hourly Rate Calculator. It allows you to input personal and business expenses such as office rent (home studio), continuing education (dance classes/conventions), and health insurance as well as your billable hours (preparation plus studio time). It then gives you the hourly rate you could charge to break even and the suggested profitable amount. Do, however, note that every teaching job has its own considerations. When considering a weekly teaching opportunity, one of the biggest factors for me is the travel time. Not only do I have to consider the time it takes to get there (time I could be using to work on my brand) but also the wear and tear it takes on my car. A small portion of every check should go toward future oil changes and possible repairs. For studios at a distance, I tend to up my hourly rate and set a time minimum. For example, if a studio is an hour or more away, I require a minimum of three teaching hours. This is an extremely personalized way to calculate your rate, a way I highly recommend. However, I know that it’s always difficult to put a price tag on your time, especially when you’re just starting out. For the person looking for a general idea of starting rates, I’ve listed a few numbers and categories below. These numbers come from personal experience and professional advice I’ve received from other working dancers. They should serve as a base rather than a rule. Just starting out: If you have a strong background in dance but are taking your first teaching job, I wouldn’t go lower than $35/hr. B.A. in Dance: Those with a bachelor’s degree in dance and a teaching certificate shouldn’t go lower than $50/hr. You earned that! Domestic Travel: If you’re asked to travel within the States, you must consider your travel time because it’s time you could have spent making money at home. Also note that whoever hired you should pay for your airfare, hotel (4 star or above), and travel to/from the airport, hotel, and studio. I would suggest a starting rate of $300. From there, you can negotiate for how many hours you teach. International Travel: Again, you must consider your travel time. Long flights can take a real toll on your body. Our bodies are our tools and should be treated with care. I would not put my body through that stress for less than $500. The rate could go up from there based on hours taught. Remember that these are starting rates. A-list choreographers may charge thousands of dollars to teach internationally. More experience means higher quality which deserves a higher rate. Know your worth, and charge for it. Choreographers may also use the Freelancers’ Hourly Rate Calculator. However, I think there’s a lot to consider outside of expenses and billable hours. Think of your favorite dance scene—like Singing in the Rain, Sweet Charity, or Dirty Dancing. Even if the dancers received residuals, the choreographers—the creators of those iconic moves—did not. SAG-AFTRA doesn’t even have a category for choreographers. But there is hope. The Choreographers’ Alliance is a new organization “campaigning to win union representation for Choreographers under SAG-AFTRA.” According to their website, they are seeking standardized rates, residuals rights, proper credit, pension and healthcare rate increases, ownership of intellectual property through copyrights, and greater recognition at the Emmys and on IMDb (choreographers are currently listed as “Other Crew” on IMDb). This would be amazing for all commercial choreographers! In the meantime, choreographers must find other ways to demand proper compensation. One source to pull from is the Stage Directors and Choreographers Society. Their website provides standardized rates for theatrical choreographers and includes upfront fees, royalties, pension and healthcare rates, and per diem. This type of compensation should be the goal for all choreographers, but sometimes it’s not possible. If a company is only willing to pay a one-time fee, use the Freelancers’ Hourly Rate Calculator to create a base rate and then factor in elements like per diem. Setting rates can be tricky, but knowing that you are worthy of proper compensation is the first step. You have trained for years and have accrued a wealth of knowledge. Just as an architect, doctor, or financial adviser deserves a good salary, you deserve a proper rate too, and it’s your job to not settle for anything less than that.